This is a special extra issue of The 70mm Newsletter issued in February 1996 with news about a new film from director Kenneth Branagh. The film will be photographed in Panavision System 65 and it will premiere in late 1996. 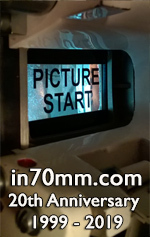 The news are still very limited, however, as soon as more information and stills becomes available information will surely hit the pages of The 70mm Newsletter. The question remains, will this 4 hour epic be released in 70mm digital sound? The question has not been fully explored yet. "Hamlet" has begun filming in 65mm as a direct result of the Film Format Seminar spearheaded by Mr Rob Hummel. Even two other 65mm projects are in development. Write a letter to Mr Kenneth Branagh (Shepperton Studios, Studio Road, Middlesex TW17 0KD, England) and tell him that you support his decision to film in 65mm. He deserves all the encouragement he can get. 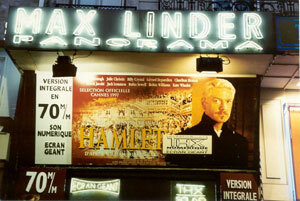 The next film in 65mm will be "Hamlet" by director Kenneth Branagh. Kenneth Branagh (Born 10.12.1960) has made films like "Henry V" (1989), "Dead Again" (1991) and "Much Ado About Nothing" (1993) and he is the co founder of Renaissance Films. The filming will begin January 30. 1996 in England. Tests will begin January 8th 1996 in England. It will be photographed in Panavison System 65 by British cinematographer Alex Thomson BSC and presented in Panavison Super 70. Alex Thomson (born 12.01.1929) has photographed more than 30 films since 1967 and among them "Excalibur" (1981), "Legend" (1985) and "Cliffhanger" (1993). "Hamlet" will be filmed at Shepperton Studios in England. Branagh Assembles Top Cast For Full-Lenght "Hamlet" (70mm) Film. Director Kenneth Branagh has assembled an outstanding cast of European and American actors for his new full-length feature film of "Hamlet" which starts shooting in the UK on 30th January 1996 for Castle Rock Entertainment. Branagh, who has adapted the Shakespeare play for the screen, will direct as well as taking the title role. With most of the casting now complete, the line-up includes Riz Abbasi, David Blair, Brian Blessed, Richard Briers, Kenneth Branagh, Michael Bryant, Peter Bygott, Julie Christie, Billy Crystal, Gerard Depardieu, Reece Dinsdale, Kenn Dodd, Angela Douglas, Rob Edwards, Nicolas Farrell, Ray Fearon, John Gielgud, Yvonne Gidden, Rosemary Harris, Charlton Heston, Derek Jacobi Jack Lemmon, Michael Maloney, Ian McElhinney, John Mills, Jimi Mistry, Sian Radinger, Simon Russel Beale, Orlando Seale, Rufuss Sewell, Timothy Spall, Tom Szekeres, Ben Thom, Perdita Weeks, Robin Williams and Kate Winslet with further casting still to be announced. Often credited with creating a popular cinema audience for Shakespeare, following his success with "Henry V" and "Much Ado About Nothing", Branagh has wanted for many years to bring to the screen the complete, full-length version of Shakespeare's greatest play. "The film, like the play, will have something for everyone" says Branagh. "It is a ghost story, a thriller, an action-packed murder mystery and a great tragedy that is profoundly moving. It is also extremely witty and I hope it will be thoroughly entertaining". Branagh has played Hamlet twice before on the stage, the last time in a record-breaking, sell-out production at the RSC in London and Stratford in 1992/3. The film will be shot in the epic 70mm format and will be made at Shepperton Studios and on location in the UK. David Barron will produce with Tim Harvey as Production Designer, Alex Thomson as Director of Photography, Alexandra Byrne as Costume Designer, Art Director: Desmond "Dew" Crowe. Editor: Neil Farrel. Corbett And Keene Limited 122 Wardour Street, London W1V 3LA, London, England. Phone +44 171 494 3478 and fax +44 171 734 2024 is handling publicity for Kenneth Branaghs "Hamlet". "Hamlet" will open before the end of the year for Academy Award consideration in the United States and territories everywhere. Source: The official press release from Corbert & Keene. Also, recently I mentioned I had an idea for another article - about the Premiere of "Hamlet" in the Waterfront Hall in Belfast on 21 January 1997. It was screened on 70mm of course, using Kinoton projection equipment installed for the occasion, which was left there and never used since - what a waste! They also installed Kinoton 35mm and 16mm too - again rarely, if ever, used I believe. My article would seek to unearth photos etc., tell the story of the Premiere, and detail the equipment etc. There seems to be very little information about this event - I don't even know who installed the equipment, screen, etc. I hope to contact Columbia / Sony in London, Branagh's production company Fishmonger Films in Shepperton Studios, London plus the Waterfront Hall itself to see if I can obtain any information. I'll let you know how I get on!